Courage, faith, obedience and devotion are a few of the words used to describe the story of Esther from the Bible. When Esther was made queen she discovered a plot from Haman to eliminate all of her people (Jews). Esther knew she must go before the king to stop the horrible bloodshed from happening. Yet, during this time period going before the king was forbidden even by death! 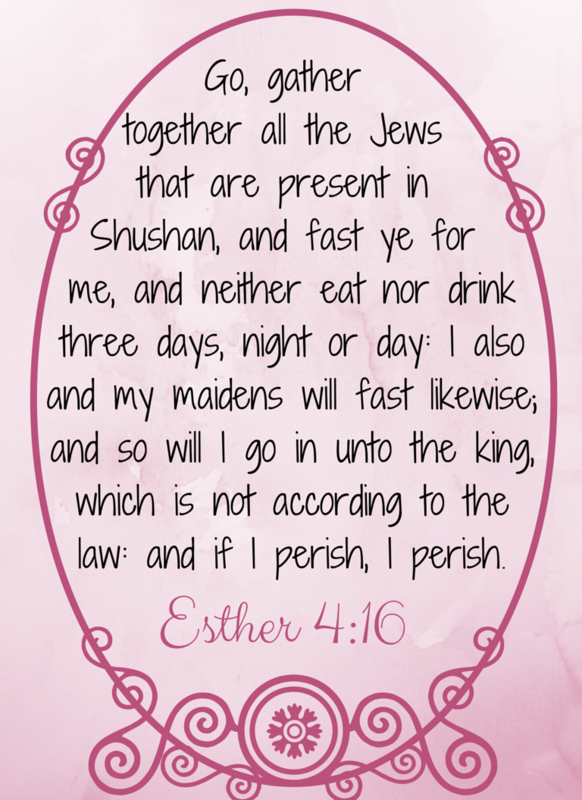 The scripture to memorize this week tells of Esther's actions to overcome her challenge. What gave her strength to go before the king? Fasting and faith in the Lord to deliver her people! What a beautiful message to everyone that as we put our trust in God, and believe in Him we can overcome anything! Esther of course goes before the King and unveils Haman's evil plan. The king is furious with Haman and his punishment is death. Esther faced death in that trial, yet she remained faithful to save her people! Who else loves this story? She is my hero! Have you ever felt there was an obstacle in your path you could not overcome? Find time this week to study the story of Esther (chapters 2 -10). Her story will enrich your mind with ways to grow closer to the God and find peace during the trials of life. Print the Scripture Memorization Challenge Week 3 HERE. Find the other Scripture Challenge Printables HERE. What a timely post! We are reading The Story as a church and this weeks' chapter focuses on the story of Ester. I will share your post with my Facebook group for The Story. Visiting from Someday Crafts.